Producing chlorine locally with a WATA device is simple, but you need to be sure of the concentration you have produced. This may depend on the quality of your salt solution, the timing and the power supply used. 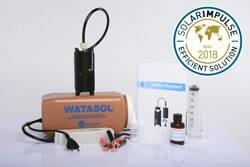 Antenna has therefore developed the WataTest, a non-toxic and inexpensive reagent, to allow producers to check the concentration, and to proceed to the dilution required accordingly. Additionally, if the producer sells the chlorine under the label WATASOL, it is essential to guarantee the concentration of 6 g/l. 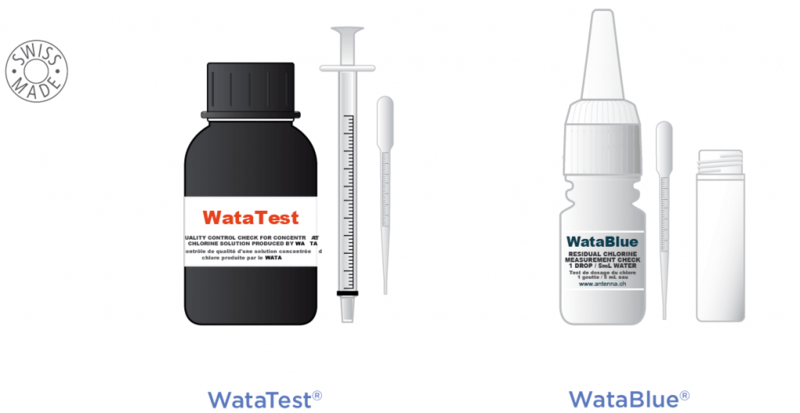 The WataTest can also check the quality of the active chlorine concentration in NaOCl, HTH, NaDCC and bleach. 2) the water is protected from recontamination during transport to the home, and during storage of water in the household. Because the presence of free residual chlorine in drinking water indicates the likely absence of disease-causing organisms, it is used as one measure of the degree of safety of drinking water. To meet this need, Antenna has developed a low-cost and non-toxic reagent: the WataBlue reagent. With its sensitivity and long-term reliability, any user can carry out safe and systematic quality control of drinking water. It is only in this way that the local, low-cost production of high-quality drinking water can be guaranteed and sustained.